BALTIMORE (CNS) — Acknowledging wide divisions in the country over issues such as health care, immigration reform, taxes and abortion, the president of the U.S. Conference of Catholic Bishops called for civility to return to the public debate. Contemporary challenges are great, but that they can be addressed without anger and with love Cardinal Daniel N. DiNardo of Galveston-Houston said in his first address as USCCB president during the bishops’ fall general assembly. He explained that the National Catholic War Council, created by the U.S. bishops in 1917 in the response to the world refugee crisis that emerged from World War I and the forerunner to the USCCB, was formed to address great national and international needs at a time not unlike today. He said the history of the American Catholic Church is full of examples of the work of “holy men and women” responding to social challenges. He particularly mentioned Capuchin Franciscan Father Solanus Casey, who ministered alongside homeless and poor people in Detroit and who will be beatified Nov. 18. “The history of Christianity is also the story of reconciliation. In 2017, we mark the 500th anniversary of the Reformation. Begun as a moment of painful division, it stands as a journey toward healing, from conflict to communion,” Cardinal DiNardo said. The cardinal lamented that abortion continues despite the existence of alternatives to save the life of unborn children. 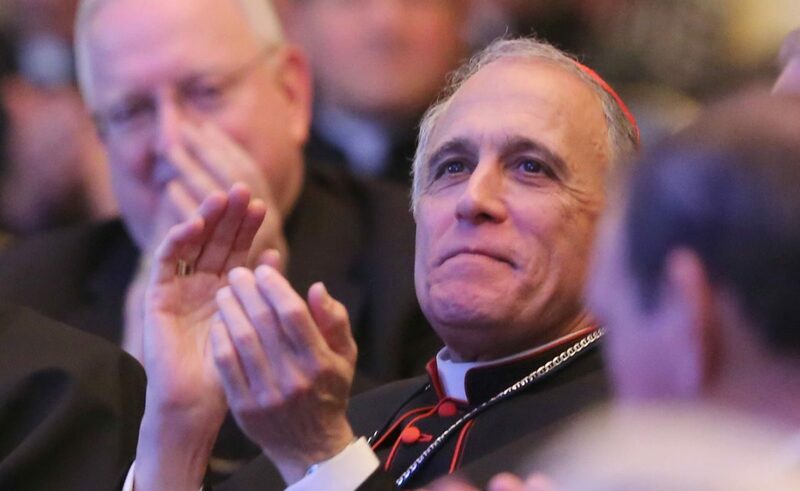 Cardinal DiNardo also laid out several policy stances for the country to pursue. The cardinal called for “good and affordable health care” for poor people and action to address the country’s opioid abuse epidemic. To applause, Cardinal DiNardo urged lawmakers to enact comprehensive immigration reform and protections for the country’s 800,000 young adults who have been protected from deportation under the Deferred Action for Childhood Arrivals program. President Donald Trump in September called for an end to the program, handing off the solution to the immigration status of young adults brought to this country illegally as children to Congress and giving the lawmakers a six-month window to act. Acknowledging that a country has the right to defend its borders, Cardinal DiNardo reminded the country’s leaders that it should be done in a humane way. “We join our Holy Father in declaring that a pro-life immigration policy is one that does not tear families apart, it protects families,” he said. Racism, too, has risen to become a major challenge for the country, the USCCB president said. “In our towns and in our cities, as civility ebbs, we have seen bolder expressions of racism, with some taking pride in this grave sin. Sometimes it is shocking and violent, such as in Charlottesville (Virginia, in August). More often it is subtle and systematic. But racism always destroys lives and it has no place in the Christian heart,” he said. “Americans don’t like to talk about it. Nonetheless, it is time to act. Our common humanity demands it of us. Jesus demands it of us,” Cardinal DiNardo said. He discussed the work of Bishop George V. Murry of Youngstown, Ohio, chairman of the bishops’ new Ad Hoc Committee Against Racism. The committee will meet with people throughout the country to learn how the best can best respond “in ending this evil,” he added. Beyond such challenges, Cardinal DiNardo said, society has had to respond to a series of natural disasters including hurricanes in Texas, Florida, Puerto Rico and the U.S. Virgin Islands, wildfires in California and earthquakes in Mexico. “We need to constantly put forward these virtues, especially in light of violence from what is a long and growing list of mass shootings in our schools, offices, churches and place of recreation,” he explained. “The time is long past due to end the madness of outrageous weapons, be they stockpiled on a continent or in a hotel room,” the cardinal said.